Melbourne shopping can mean many things, from exclusive haute couture to local fashion designers, from vintage clothing to original designs, from markets to major brands and factory outlets. There is a sense of style in the way people dress in Melbourne, in the interiors of shops and cafés, and cobbled laneways, just window shopping in Melbourne can make a great day. We may not be quite Paris, but we are catching up. Many people come to Melbourne to shop and for its atmosphere. There are many inner-city precincts, each with its unique character and style, cafes, outdoor eating and unique shops. There is CBD shopping with its Paris End, its unique laneways and boutiques, as well as department and brand stores. And there are the factory outlets and Melbourne shopping centres around the greater Melbourne. What makes Melbourne shopping interesting, are its quirky and eclectic precincts, each with their unique local shops. These areas are a feast for the senses, with bars, cafes and restaurants in many diverse styles. This is where you can purchase original, interesting and one-off wares, rummage through book shops, vintage stores, jewellery, fashion and design. Most renowned is Fitzroy shopping. There is also Collingwood shopping, Richmond, Westgarth, Northcote, Brunswick, North and South Melbourne. The inner north is where artists and musicians have traditionally come together (although high rents are driving them further out and shops are becoming more exclusive). This has created the lively insiders Melbourne shopping and cafe scene. Strolling through these areas you will find many exotic and quirky shops selling anything from hand crafted goods to vintage fashion and art. People in Melbourne love to read: on trams, in cafes or in the parks. There is a great array of local Melbourne bookstores in the inner-city areas. This is where you can get your hands on many outstanding new and second-hand books that reflect the taste and style of this city. And, caught in the creative flair, you will also find many Melbourne flower shops as well as shops selling local produce. The slow food Melbourne movements is thriving in these precincts. This is where many locals hang out. Melbourne lanes and arcades. Particularly around Flinders Lane you can stroll through the narrow lanes and will be surrounded many imaginative small shops and original fashion designers as well as footpath cafes, buskers. The Nicholas Building, on the corner of Swanston Street and Flinders Lane, houses many artists and crafts people, some of which sell their wares right in the building. 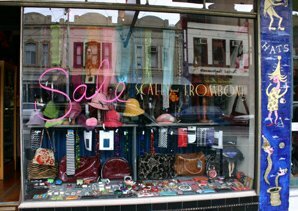 There you can also find some ecclectic Milliners selling Melbourne Cup Hats and other fashion accessories. The lanes are also great places for coffee or lunch. There are Melbourne markets of many kinds: produce, cheap goods, organic produce, arts and crafts, fashion or vintage markets and night markets. Many of these come have live entertainment and great atmosphere. This is where many Melburnians shop or hang out. This is also where you can find hand crafted or vintage wares you may end up treasuring for years. Melbourne is the undisputed fashion capital of Australia and the hot spot for Australian fashion designers. Many have set up successful Melbourne shops or are selling their creations at arts or fashion markets. The Melbourne CBD has different fashion corners. Within three blocks you can do your fashion city shopping in Melbourne. The blocks between the QV, Melbourne Central and the GPO, will give you access to fashion brands, department stores and some local fashion designers. Then there are the intimate boutiques of Melbourne fashion designers around Flinders Lane and Little Collins Street. There you can do your funky Melbourne shopping and will always find a unique piece for a special day out. At the upper end of Collins Street, the Paris End of Melbourne, you find the luxury and glamour and the best high end fashion shops in Melbourne, flagship stores such as Chanel,Tiffany and Co., and Louis Vuitton selling the latest in fashion, apparel. Even the flower shops are of a different class there. You might want to take time out from your shopping and get pampered by booking into a day spa Melbourne. Or check out one of the glamorous coffee houses that offer High Tea Melbourne, which has become a very popular luxury activity. The Docklands have sprung up as a Melbourne shopping paradise. If you are after brands, fashion, sporting equipment, apparel or home wares the Harbour Town Shopping Centre might keep you going for a while. Southeast of the city, there is Chapel Street, Prahran, which you need to add to your Melbourne shopping experience. This is also where you find many popular brand stores, as well as designer labels, fashion boutiques and chic cafes, a great place to enjoy excellent wining and dining. And at last, there is the largest shopping centre in the Southern Hemisphere, the Chadstone Shopping centre. 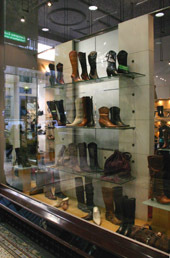 It has a high end section where you will find any label, from fashion to interior decor. And not the only one! Large Melbourne shopping centres are scattered throughout greater Melbourne, where I usually find nothing, but have to get out quickly, but that is just me. But really, why pay full price? There are a large number of factory outlets in Melbourne where you can get great deals and discounts on just about any brand and label. These factory direct warehouses are strewn through primarily the inner Melbourne suburbs. You just need to know where to go! To be sure not to miss some insider bargain spot, there are Melbourne Outlet shopping tours that will take you to factory outlets you might not otherwise find, and that you can always come back to. All in all, what makes Melbourne shopping such a special experience? Really, all of the above! Yet, it is the uniquely Melbourne shops with their goods conveying the love of beautiful things and the spirit of play, that draw you into the insiders Melbourne culture. And these are always in arms reach of a cosy café and good coffee.